OK… so I planned on “live blogging” our wedding plan progress, but time just hasn’t allowed for it. I have been focusing what little writing time I have had on my training progress. I have a lot of people who have donated a lot of money for me to do the 3 Day walk. I am only half-way to my goal, and I feel I owe it to my donors to keep them up-to-date on my progress. We have been very busy with moving me to MN, buying a house, wrapping up loose ends on the wedding plans, planting and maintaining flowers for the big day… Wow! Wears me out just to type it all! Here’s the nutshell version of our journey to Happily Ever After. 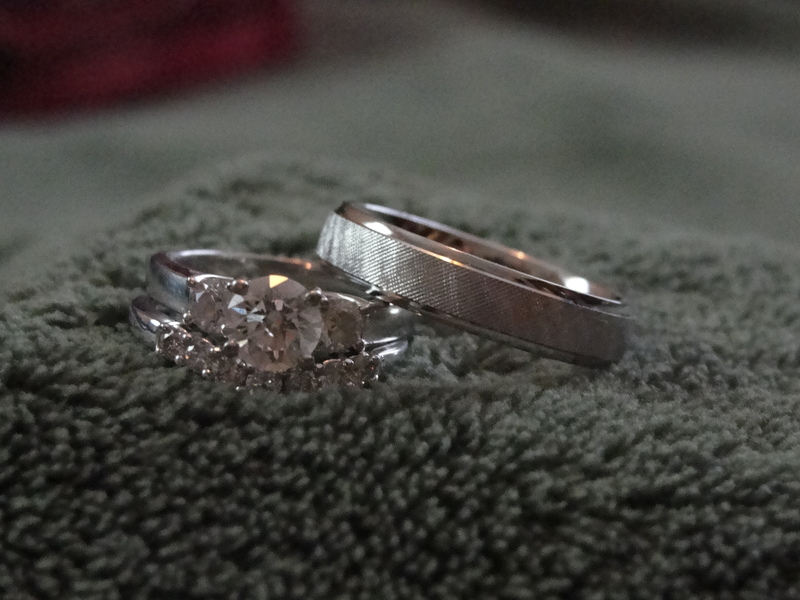 When it was time to get Jason’s ring, we sort of did the same thing. He also didn’t know what he wanted, per se… we picked out a few for him to try on. We’d compare each one, and eventually narrowed it down. Being that it was Valentine’s Day, they were offering extra discounts. Jason decided to “get lost in the mall for a while” while I purchased his ring. This was a slightly easier process. We had kicked around the idea of making our own playlist, and just playing it on Jason’s DJ Equipment. We decided we didn’t want to have to worry about technical difficulties during the event, and/or not allowing for requests… We narrowed down to 2 DJ companies – Instant Request and Midwest Sound. Midwest Sound came highly recommended to us, and had a cheaper deposit (as well as their overall fee being cheaper), so our decision was made! Choosing a photographer was one of the most stressful parts of the wedding planning! Most of the photographer’s websites were less than helpful. They’d have all these beautiful pictures, but no info on packages, or pricing… or they’d have ala cart style pricing, which made the overall price harder to determine… Finally, we were at Jason’s Holiday party for Digineer. One of his co-workers does photography with his wife (Sajous Photography). We spent a lot of time talking about different aspects of wedding photography, and my frustrations in just trying to find someone good (or even how to tell if someone is good)! I really liked Stan and Lorita. They were easy to talk to, had great ideas… I really liked the idea of having two photographers, to get different angles of the same thing during the ceremony and reception, but also didn’t want to hire anyone who would already be a guest at our wedding… Lucky for us, at the Holiday party every year, a staff picture is taken. After talking to the photographer for a while, I decided to go with him. Dean, with Northern Sky Photography has been great to talk to, bounce ideas off of, etc. This was probably the biggest source of stress in our overall wedding planning process. We knew we wanted a pig roast. We wanted it to feel like a big Backyard BBQ. What we didn’t realize, is how expensive it can be! We had a hard time finding anywhere local to do the pig roast, and anywhere further away, would charge an arm and a leg. My aunt told me a cousin does pig roasts, but again, we didn’t want to hire anyone who would be a guest. Unfortunately, we were unable to find anyone else, so my cousin, Andy, is going to do it for us. As for all the side dishes, we were going to do all the work ourselves, but since life has been so crazy, and we are overwhelmed with everything we have going on, we decided to hire it out. We were going to hire and old high school friend, Brian, with Lettuce Cater, but he had another event that day. He referred us to another friend (who I used to work with at Pizza Hut forever ago), Jeff, with Twin Cities Flavor. The Flowers, Cake, Tuxes, etc. I was lucky, in that I braved a snowstorm to go to the Menomonie Wedding Fair. It was there that I found a woman, in Spring Valley (very near my Mom’s house where the wedding will be), who does cakes, flowers, and tuxes. Jason and I met with her to get some info, and we booked her on the spot! Three checks from one vendor? Awesome! Another plus? She grew up right next to my Mom’s house, so she knows EXACTLY where it will be!! Gonna skip mentioning how I shocked you last night by signing off on the entire menu you got quoted out with no discussion? Yes, that was definitely shocking, but in a good way! Hiring someone to make all the food is gonna save us a lot of time in the long run! What a relief!